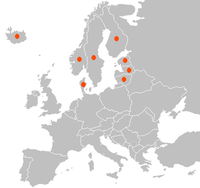 NordplusMusic webpage provides information about the cooperation of Nordic/Baltic music academies within the framework of the Nordplus programme. Here you can see which institutions belong to NordplusMusic, find the contact details of institutional coordinators and read about the genre-based networks that form the basis of Nordplus cooperation. You can keep yourself updated with ongoing and past intensive courses and conferences in member schools and read about the best-case projects. The site also provides relevant information and documents for student and teacher exchange.